Maria Genna, 76, died Monday, September 3, 2018. Born in Brooklyn, she was a lifelong Kearny resident. She worked for Goody Products in Kearny for many years before retiring. Maria was the beloved mother of Gina Grogan and her husband Richard, Rena Lampe and her husband Stewart and Ralph Avalone and his wife Laura, the cherished grandmother of Christopher, Michael, Sean, Nicholas, Giavanna, Mathew and Joseph and the dear sister of Josephine Marzano and Michael Genna. Relatives and friends are invited to attend the Funeral Service at the Parow Funeral Home 185 Ridge Rd., North Arlington on Friday, September 7th at 10:30 a.m. Interment Holy Cross Cemetery, North Arlington. 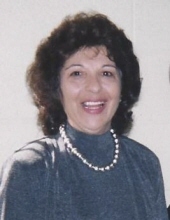 Visitation will be held on Thursday 4-8 p.m.
To send flowers or a remembrance gift to the family of Maria Genna, please visit our Tribute Store. "Email Address" would like to share the life celebration of Maria Genna. Click on the "link" to go to share a favorite memory or leave a condolence message for the family.